Art by William H. Keith, Jr.
From the want ads of a starport news service comes 20 short adventure situations for use with Traveller. Job opportunities abound for adventurers in this collection of scenarios which can lead a band of characters into anything from a luxury cruise to a mercenary expedition. Ideal for referees who need quick inspiration or a way of enlivening an ongoing campaign, this Traveller supplement makes adventure as close as the nearest news stand. 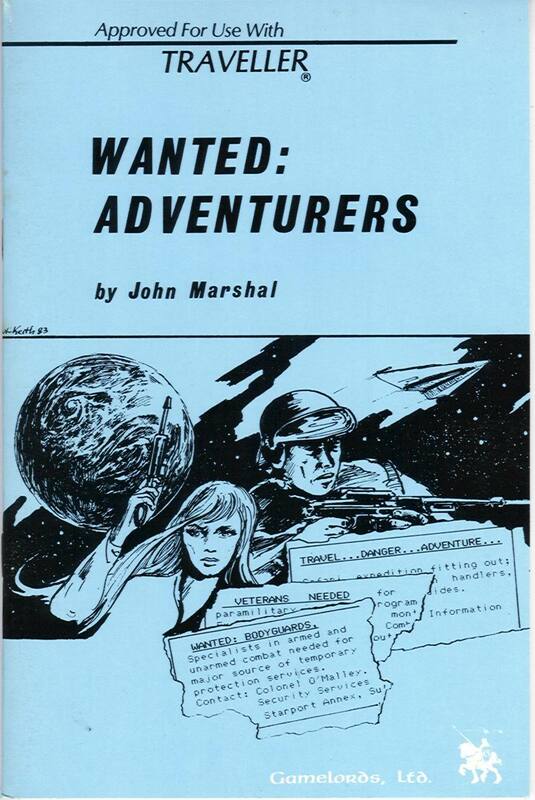 Let your players find the job they've always wanted ... just turn the pages to Wanted: Adventurers. Published by Gamelords, Ltd. 1984. Reviewed in Different Worlds #47. Startown ... the rough and tumble district on any world where travellers can find anything from entertainment to the worst sorts of crime and corruption. Condemned by the majority of honest citizens, exploited by the criminal subculture, and visited by starship crews and other travellers looking for entertainment, information, jobs, or almost anything else, this is "a wretched hive of scum and villainy" ... this is Startown. 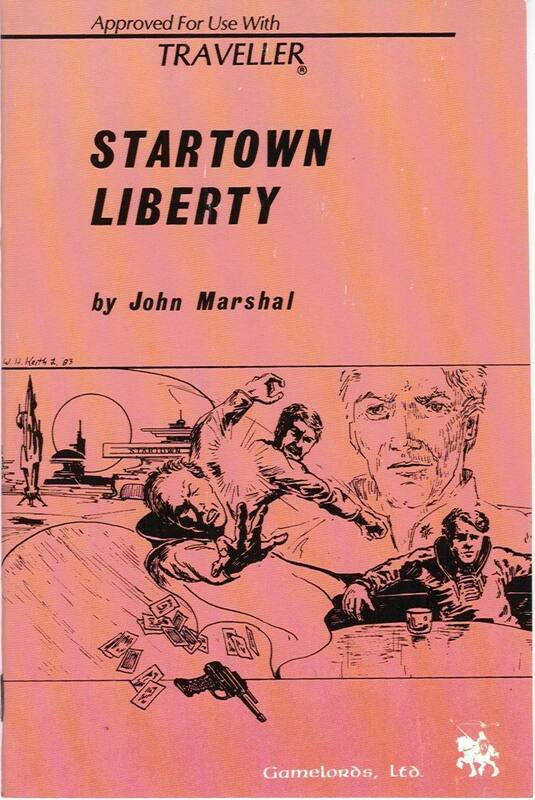 Startown Liberty is a collection of detailed encounter tables designed to generate random encounter situations for Traveller. From the streets to the night spots to the back alleys of Startown, tables and encounter descriptions give depth and detail even to innocent encounters that may have no bearing on the adventure or campaign at hand ... but serve to provide flavor, atmosphere, and a source of distraction or even new adventures that will serve the Traveller referee in good stead. Reviewed in Different Worlds #37. The journals of the noted galactic wanderer Aramais P. Lee have now been converted into a referee's aid suitable for use in any Traveller campaign. 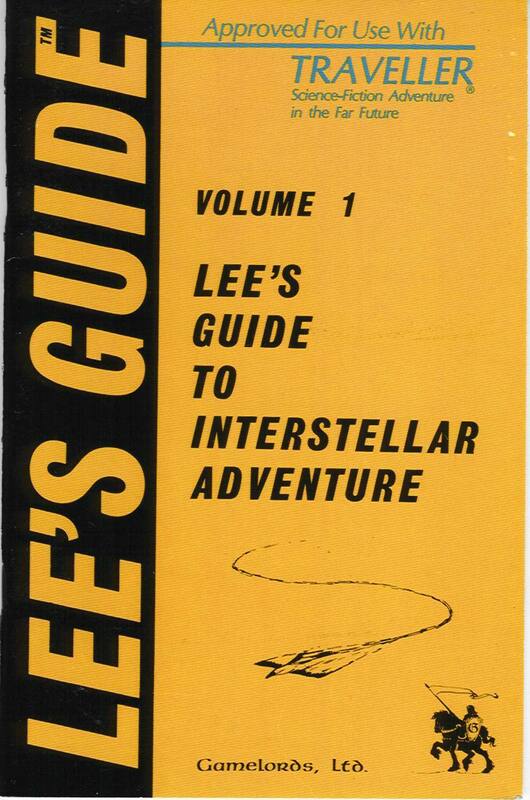 Lee's Guide (Vol. 1) provides full planetary specifications and detailed plot outlines for 10 worlds in which the situations taking place on the planet form the basis for a varied range of adventuring opportunities, suitable for both small parties and large groups. Each world is also keyed for use with GDW's Spinward Marches and Solomani Rim sectors. As an additional bonus, this volume also presents a series of adventures centered around the X-Boat system, the Imperium's primary communications network. Whether you're new to Traveller, or an experienced referee looking for exciting new challenges, this book will provide months of planet-busting adventure. Reviewed in Different Worlds #46. The Undersea Environment is a Traveller supplement dealing with the particular problems found in an aquatic environment. 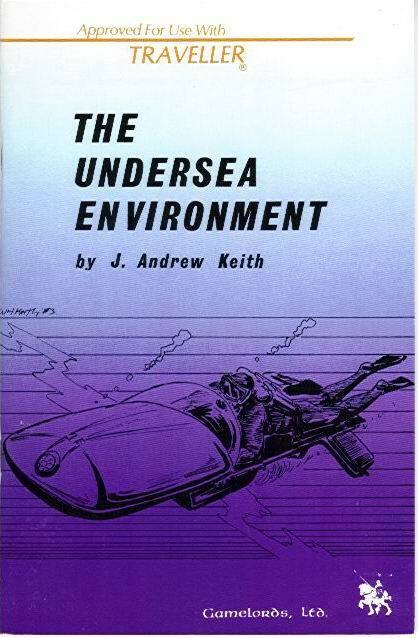 Included are specific rules systems designed to simulate underwater activities and hazards, explanations of gear and equipment available for underwater use, and a guide to special events and encounters to aid teh referee in constructing underwater encounter tables. Challenge your players to broaden their horizons and enter The Undersea Environment. Reviewed in Different Worlds #36. Adventure awaits on the watery world of Yarnfahl, as players join the race to salvage a valuable cargo from the Drenslaar, a sunken star freighter. But will they elude detection by hostile forces long enough to complete their task? The Drenslaar Quest is a complete adventure for Traveller. This scenario makes use of rules and information presented in The Undersea Environment, a Traveller supplement also by Gamelords, Ltd., and Traveller Book 4, Merceary; use of these supplements is recommended, but not required. Reviewed in Different Worlds #38. The Mountain Enviroment is a Traveller supplement dealing with the particular situations and problems of travel and survival in rugged terrain. 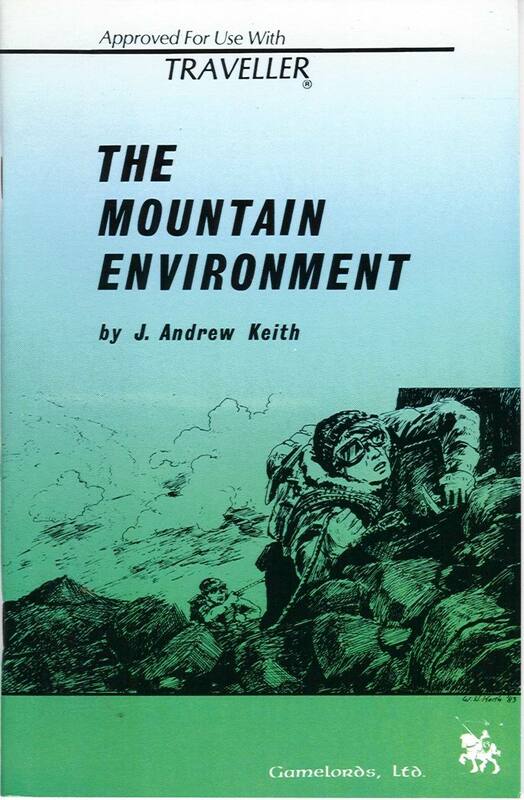 Included are specific rules systems designed to simulate mountaineering and other activities and hazards found in mountain terrain, explantions of equipment available for use in such terrain, and a guide to constructing specific mountain situations, special events and encounters, and adventures. Challenge your players to broaden their horizons and enter The Mountain Environment. Reviewed in Different Worlds #40. Lady Sandra Lockhart was rich, famous ... and bored. A thrill-seeker and daredevil, she was always on the lookout for new horizons to conquer. Now she has set her sights on the triple peaks of Anekthor. Anekthor, the majestic, unconquered mountain, shrouded in snow and mystery. Anekthor, home of the enigmatic Windstalkers, creatures of legend whose howls are said to signal the death of climbers. Anekthor, where an old love and an old hatred await Lady Sandra's challenge. With team of experienced adventurers at her side, Lady Sandra sets out on a dangerous quest - the Ascent To Anekthor. 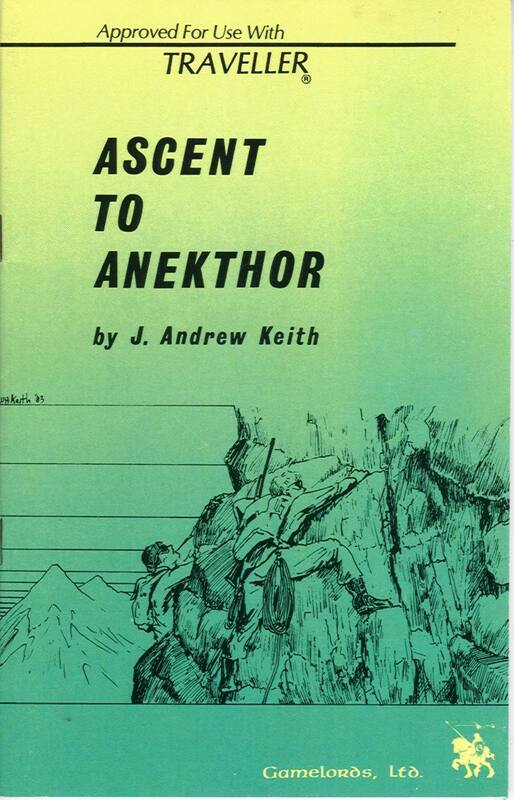 Ascent To Anekthor is a complete adventure for Traveller, making use of rules and information presented in The Mountain Environment, a Gamelords, Ltd. Traveller supplement. Use of this supplement is recommended, but not required, for play with this scenario. 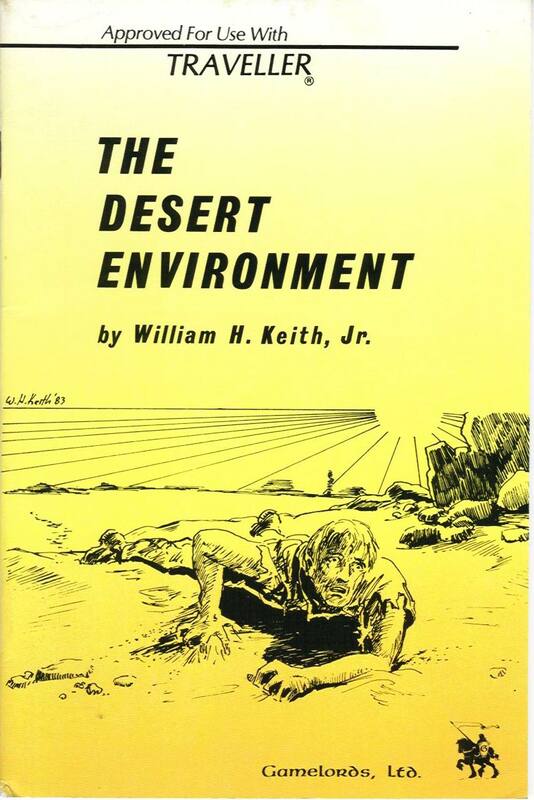 The Desert Environment is a Traveller supplement dealing with the particular situations and problems of travel and survival in a desert climate. Included are specific rules systems designed to simulate all aspects of desert survival, explanations of equipment available for use in such terrain, and guidelines for setting up specific desert situations, special events and encounters, and adventures. Challenge your players to broaden their horizons and enter ... The Desert Environment. Reviewed in Different Worlds #42. Riches, danger, and mystery lie within the arid wastes of Tashrakaar, a desert world peopled by the savage and inigmatic Duneraiders. The players soon learn that desert nomads and desert heat aren't the only enemies they face when they find themselves trapped in the midst of vicious inter-corporate war! Duneraiders is a complete adventure for Traveller. This scenario makes use of rules and information presented in The Desert Environment, a Traveller supplement from Gamelords, Ltd. 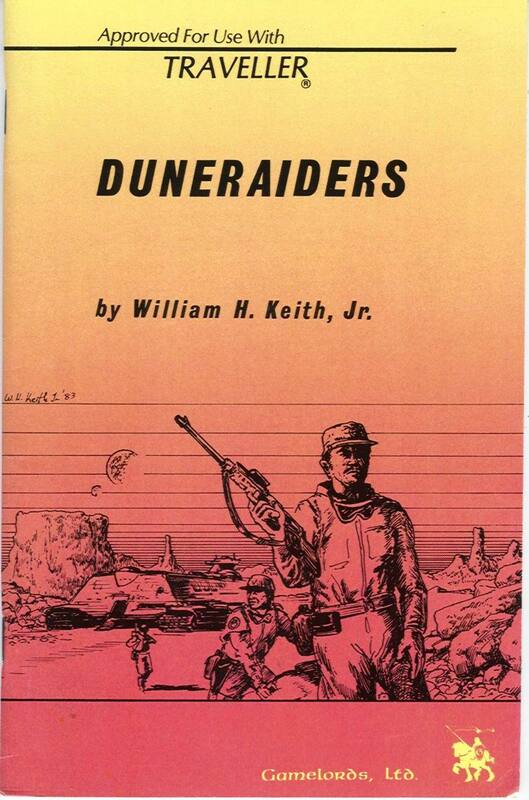 The Desert Environment is recommended for playing Duneraiders, but not required. From the navigational computer files of the Imperium comes A Pilot's Guide to the Drexilthar Subsector, a detailed examination of a single subsector of Reavers' Deep on the imperial frontiers. 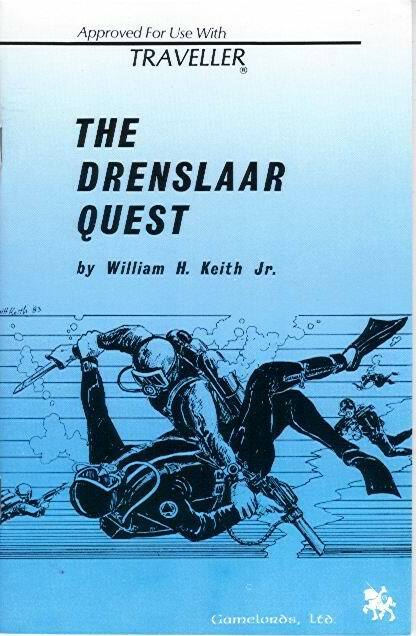 This supplement presents background information on the Deep and on the Drexilthar subsector (setting for the Gamelords, Ltd. adventures The Drenslaar Quest and Duneraiders). Each world in the subsector is explored in sufficient depth to be the setting for one or more specific adventures for use with Traveller. Planetary data on each world is also of use in conjunction with the Gamelords Traveller supplements dealing with environments. 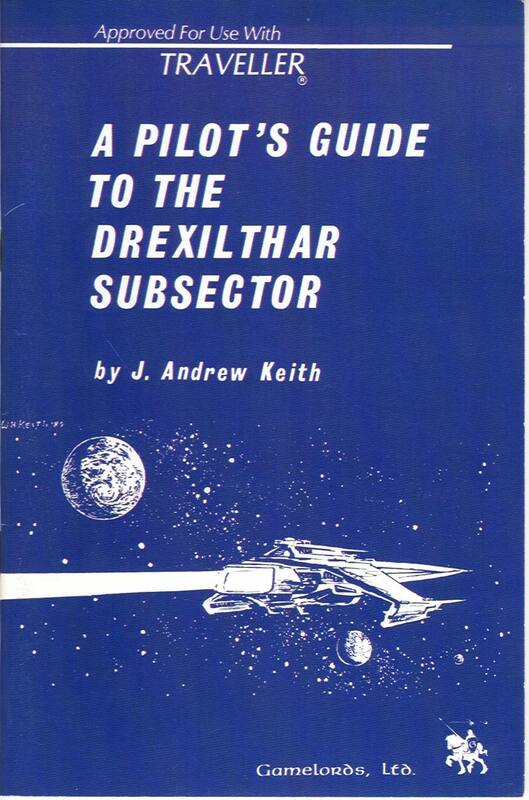 Come explore the Traveller universe ... with A Pilot's Guide to the Drexilthar Subsector. Reviewed in Different Worlds #41.